Hey guys, I just moved into a new shop. While the move is exciting for me, there are a few issues with regards to the building wiring and power availability. The first thing that I need to do, is run two or three dedicated 20amp lines, one for my new drum sander and then one for each of my 3HP shapers. (My other shapers are 110). The second issue is that I am not sure the existing wiring for the 110v machines are going to be up to the task. I say that because some, not all, but some of my machines seem to be acting underpowered. It’s like the existing 110v wiring is not fully optimized and the machines are chocking. I am not very well versed on electrical knowledge, so I was hoping you guys could help me figure out a few things. I am unsure how many amps come into the building from the pole. I made a call to my electric company to have them give me a quote on possibly running a new 200amp (or more) line into the shop. I have a breaker box, with plenty of breakers and 12g wire. So if I have to, and if I can afford it, I can totally redo everything. Anyway, I have attached some pics of the 2 boxes that are all part of the electrical grid in my new shop. 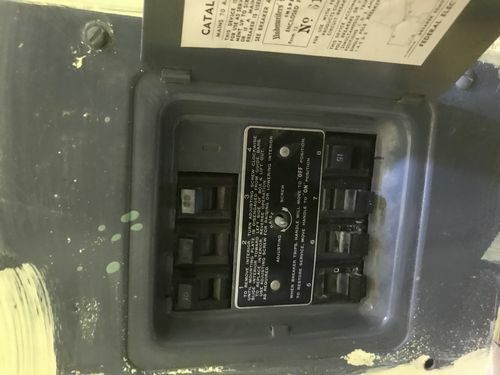 What I would like to know is would it be possible to add two or three dedicated 20amp lines to the existing breaker box? Looking at the breaker box myself, I do not think that would be possible as there seems to be no room for more breakers? What do you guys think? Obviously if possible I would like to not have to run a new 200amp line and redo the breaker box and wiring, so any suggestions on what I can do to get more power out of what I already have, and whether I could add two or three dedicated 20amp lines with the existing setup? Second box, not sure of its purpose. Oh I am definitely having the work done by an electrician. The only other panel that I can find in this buildings is in the pic below. Doesn’t seem to be any other main panel. I think the problem with the sluggishness of my equipment is because there are 7 outlets and two lights on each breaker. Only 14 outlets in this building. All of those take up only two breakers, the other six breakers are 1.-air conditioner, 2. Heater, 3. Lights that aren’t connected to run with the outlets, 4.-bathroom lights and one bathroom outlet, 5.-second room with 4 outlets, and the last breaker I am unsure of. What I might do, assuming the sub panel is getting enough juice, is rip out the existing wiring, which is in conduit mounted on the face of the walls throughout the building. Then dedicate each breaker for two outlets, 12/2 wire, and sacrifice a few outlets. Then I could leave two slots open for my two 220 lines. Does this sound reasonable? I will check the main box and see if I can figure out how many amps I got coming in. Also, this is a commercial building that was built during the 1950’s, it is not my garage, nor is it part of a house. The first box pictured is a Federal Pacific, those are known fire hazards and some insurance companies won’t even insure a house with them in it. No matter what you decide to do, replace that panel. Given the 1950s origin, you’re almost certain to have something like a 50-60A main coming in through that fire hazard of a main box. You’ll want to replace the main box at the very least. Sometimes they would have fed the main with up-sized wire, so you might be able to get a 100A main installed without pulling new wire from the pole. That is unlikely, however. Given the 1950s origin, you re almost certain to have something like a 50-60A main coming in through that fire hazard of a main box. You ll want to replace the main box at the very least. 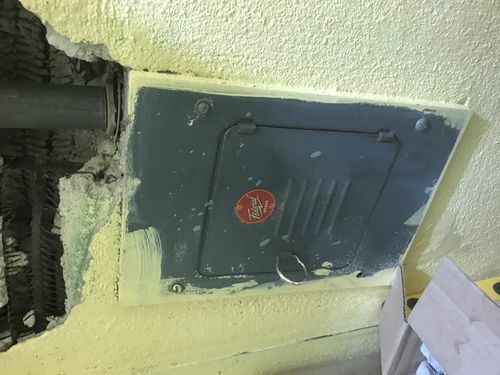 Sometimes they would have fed the main with up-sized wire, so you might be able to get a 100A main installed without pulling new wire from the pole. That is unlikely, however. If you’re using one tool + dust collection at one time, you could quite easily get away with a 60A service. 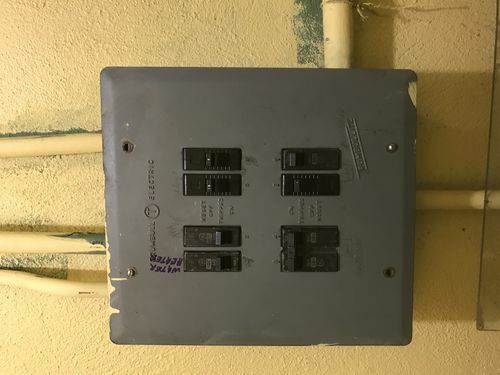 You’d just need to replace the panel with one that is a) not a crappy fire hazard 1950s relic and b) roomy enough for the breakers you need to run. You don’t need separate 20A breakers for the shapers unless you plan to use more than one of them at the same time. With 20A receptacles, you can put more than one on a circuit. Assuming single person use, you realistically only need two 240V circuits – one for tools, and one for dust collection. That leaves you plenty of capacity for 2-3 120V circuits for everything else. Cost is hard to say, it will vary hugely by region. Here in Chilton, County, Alabama, you and I could completely rewire your shop, have the Co-Op hook you up, then go eat BBQ for way less that $1000 (including materials). Cost aside, I’d be tempted to do away with all those existing boxes, drop in a Square D, QO panel, and rewire everything from that point. Here in this area, not sure about where you are, the location of the meter (on the pole, or on the building) will affect the cost of an upgrade as well. If you have a service pole and the meter is on it and then there is a triplex coming to your building, from the meter on is yours to upgrade. IOW, the power company, at least here in this area, doesn’t service anything beyond the meter. That is all customer owned and maintained. Some areas could have different policies. I would highly recommend what they call a “heavy up” to a new panel. If you are looking at putting in a central A/C system or heat pump, I would go with 200 Amp 220/240 volt service. The heavy up includes the cables to the pole and main breaker. This will give you the capacity that you will need now and the future. I would then put new lines from the new panel to the shop and out in a sub-panel there (60 Amp, 220 volt) should be more than enough with 6 breakers (4 for 120 and 2 for the 220). Make it safe from the start – costs you a little more but much less than recovering from an electrical fire. Like others have said, the cost of changing that meter will vary widely (hugely) depending on who provides your power. Co-ops are usually the most friendly, and municipal power the least (IME). The only way to know for sure is to ask them. The other that may vary is the amount of red tape involved. A local co-op is little more than a phone call to get a meter installed, but the public power provider I have expects a complete write up on their forms before agreeing to run a meter. For my daughter, required the electrician, permits, inspections, all of it. The result is a safe electric environment.